Home > Uncategorized > It was bound to happen sometime……. It was bound to happen sometime……. Late last night, we were joined by Matt “fresh meat” Brittin, an old rowing mate of the highest pedigree, along with Marysh and Alison Chmiel, and their young son Stan. Marysh has been a long standing supporter of this project and we were all delighted to have him and Al with us, not least because they are both hard as nails rowers too! Marysh is also a maker of furniture that is of truly exquisite quality and even before he came out, he made for me and the project 90 presentation boxes from the same mahogany as the boats. Inside these small, perfect little boxes are individual oars, carved by hand by Marysh and Al’s children. These little gifts, presented when participants have finished their stint, have brought tears to the eyes of recipients and have been one of the highlights of the trip. Fabulous sunshine greeted us this morning and a throng of Louisiana characters joined us to wave us off and wish us well. Marysh rowed with me, with Al steering. Matt joined Paddy with Mel steering. They went out just before us and we pushed off just behind. We paddled a few strokes away from the bank and, as Marysh was adjusting his foot stretcher, I noticed we had some water in the boat. I asked if Al had a sponge as the stream pulled us further from the bank. As she was looking for one, I noticed that we were taking in water and at some rate. We were, in fact, sinking and sinking fast. I whipped the skiff round as quickly as I could, whistled to Graeme and the shore crew and frantically got us to shore. The other boat came in and we lifted out the Richmond and put it on trestles. 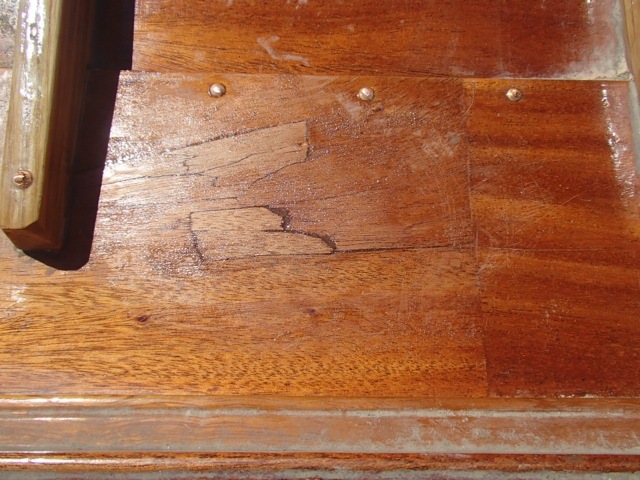 We lifted the footboards and, sure enough, just by the centre of the boat was a major hole, with the mahogany splintered up inside the boat. 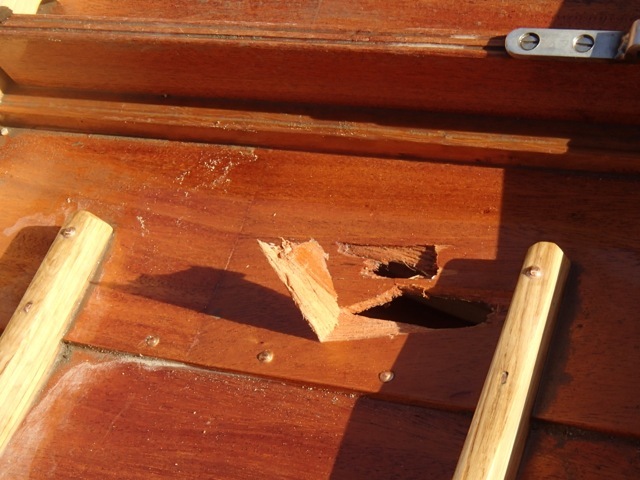 It was obvious that as we had come ashore yesterday we had hit a sharp rock at the wrong angle and caused the damage. Thank goodness we were within shouting distance of the shore – a smaller leak and we would have gone down later, miles from the crew support. It was unbelievable luck that it happened when it did, especially when we considered the beating the boats had withstood upriver through rapids and rocks. But we also had one other staggering piece of luck – we had Marysh! He immediately gathered up some tools and went to work, aided by Paddy. He painstakingly removed each splinter of wood individually and laid them on pieces of kitchen towel to dry and in the exact order of removal. He then set about the same procedure on the underside of the boat. Then he cleaned up as only he could and dried out the mess around the hole. He waited for it all to dry out and then he put it back together, glueing each fragment with epoxy. It was mesmerising to watch – no brain surgeon would have taken more care. He then scraped, millimetre by millimetre, until the repair was barely visible. It was like watching a world class magician in slow motion. 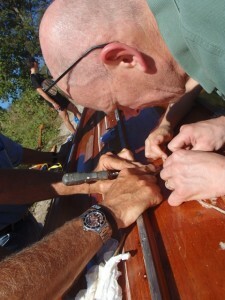 He covered the two sides in tape, to allow the epoxy to fix whilst we went on the water. It took four hours to complete and, frankly, if you had varnished over his repair you would barely notice it. Truly astonishing. We went afloat at 12, and paddled into yet more sodding south headwind for 35 miles. Matt and Paddy were, as expected, very quick, but Marysh and I plodded along resolutely. Alison rowed brilliantly with me for the last hour and a half and we finally reached Natchez at 16.30 or so. The heat of the day and the waiting for the repair has left us all a little jaded, but today was another adventure for the team for sure. I am endlessly astonished by the way this team continues to receive setbacks and simply deals with them, quietly, efficiently, stoically and just gets on with the task. It is humbling. I confess that I was tired in the last hour of today’s paddle, pushing as ever into that omnipresent south wind. We have had it now for weeks and weeks and it is getting old (as am I). However – and hold the front page – we are told by the forecasts that tomorrow, for at least one day, we have a north wind. Amazing stuff John. The Trinity Dublin crew of 1995 are rooting for you as you hit the home stretch of an amazing odyssey. Keep it up! Your story is amazing! The hole that Richmond was very big! Glad you found it when you did and that your crew was creative and handy to fix it! The end is in site! Great luck to have such a craftsman at hand, at the right time, & for the perfect repair. You need a bit of luck John.